Science-fiction writers predicted Ukraine conflict: Now they’re fighting it. They predicted and possibly inspired the conflict in the Ukraine, and now they’re fighting it. 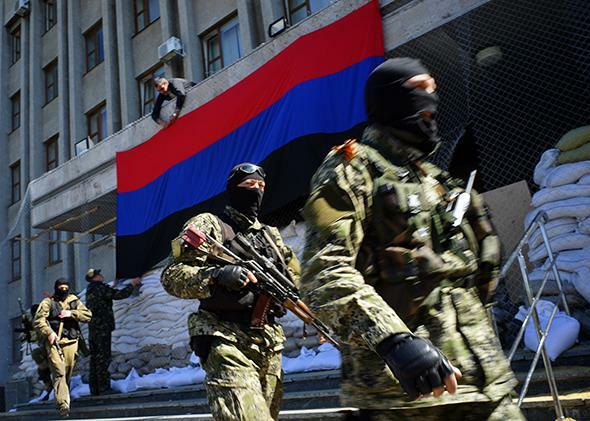 A pro-Russia activist hangs a flag of the “Donetsk People’s Republic” on the regional administration building seized by separatists as armed men guard the premises in Slavyansk, Ukraine, on April 21, 2014. A pro-Western, NATO-backed Ukrainian government faces a stubborn insurgency in the pro-Russian East. Fighting rages around Donetsk, with civilians dying in artillery fire and airstrikes, while Russian troops mass on the Ukrainian border. The latest headlines? No, a two-novel series by Russian-Ukrainian science-fiction writer Fedor Berezin: War 2010: The Ukrainian Front and War 2011: Against NATO. The Age of the Stillborn. A far more straightforward vision of Russian good vs. Western evil is offered in The Age of the Stillborn by Gleb Bobrov, who like Berezin is an ethnic Russian from Eastern Ukraine (Luhansk) and an Afghanistan war veteran. The apocalyptic novel, set in a near future in which a brutal Kiev regime seeks to quash rebellion in the East with NATO help, was first published online in 2006 and became a hit on the Russian Internet before going to print in 2007. Donetsk citizen Grigory Savitsky made his literary debut in 2009 with Battlefield Ukraine: The Broken Trident, which depicts a scenario uncannily similar to Berezin’s saga, right down to 2010 as the start of the war. The back cover summary refers to “ ‘Orange’ Nazis” who provoke a civil war in Ukraine and unleash genocide against the Russian-speaking population, “wiping entire cities off the face of the earth”—aided by NATO “peacekeeping” troops and American air power. The stream of Russo-Ukrainian war literature published in Russia at the end of the 2000s—both speculative fiction and conspiracy-theory nonfiction—alarmed Ukrainian politician Arsen Avakov, then governor of the Kharkiv region and now Ukraine’s minister of internal affairs. In an emotional March 2009 post on the Ukrainska Pravda website titled, “Do the Russians want war?” Avakov suggested that the books were part of a deliberate Kremlin strategy to build up popular support for war against Ukraine by playing to Soviet nostalgia among older readers and ignorance among younger ones. 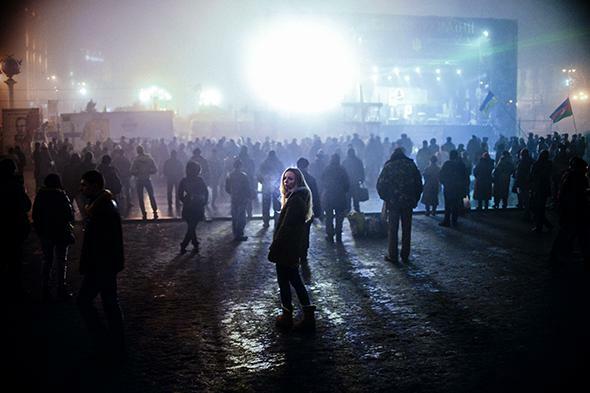 A woman looks on as people watch news on a large TV screen at Independence Square in central Kiev on March 4, 2014. 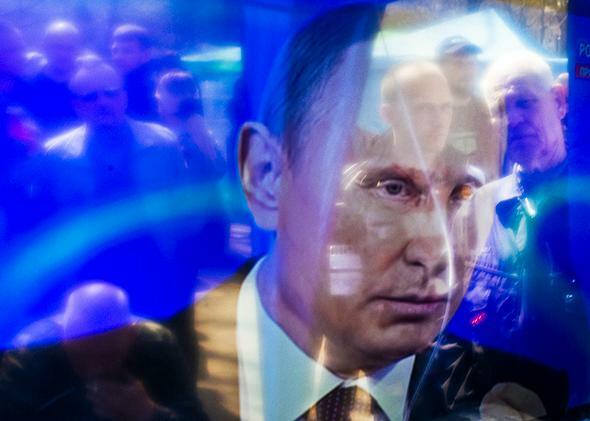 Pro-Russian activists are reflected on a TV screen as they watch a broadcasting of Russian President Vladimir Putin’s annual televised Q&A session with the nation outside the secret service building in Lugansk, Ukraine, on April 17, 2014. Meanwhile, Berezin’s own LiveJournal update about his new appointment began with the words, “I have found myself in an alternate reality.” A grainy video he recorded a few days later, which opens with the strains of the World War II–era Soviet battle hymn, “Arise, great country!” certainly has an air of alternate reality about it as the surprisingly soft-spoken, bespectacled man—who really does look the part of middle-aged sci-fi nerd more than military commander—urges the men of Donetsk to take up arms and defend their homeland against the enemy at the gates. War 2010: The Ukrainian Front. As you can see, this is not exactly brilliant prose. But did it help instigate a war? In his essay on “the writers’ war” in the independent Novaya Gazeta, Bykov goes so far as to say that the conflict in Ukraine was “predicted, meticulously planned, and finally executed” by sci-fi and fantasy writers. This is an exaggeration, and Bykov, who is known as something of a provocateur, concedes near the end of the essay that he did not mean it literally. (Interestingly, Bykov is the author of his own speculative epic, Living Souls, in which Russia is plagued by civil war and chaos after the discovery of a new wonder energy source robs it of both revenue and relevance.) Yet the exaggeration has an element of truth: The quasi-futuristic thrillers in which pro-Western Ukrainian “Nazis” seek to slaughter or enslave Eastern Ukraine’s Russian population certainly helped prepare a fertile ground for the most paranoid charges against the current government in Kiev. And many of the people involved in the armed conflict probably do see it, on some level, as a chance to act out their fiction-driven war fantasies. Real life, unlike Berezin’s and his comrades’ fiction, currently seems very unlikely to end in the victory of the East’s pro-Russian rebels. No one knows as yet if the leaders of the “Donetsk Republic” will flee to Russia, fight to the death, or face Ukrainian courts. In any case, Berezin has told Rossiyskaya Gazeta that if he gets out of his predicament in one piece, he will churn out fiction “at machine-gun speed.” Perhaps he can write a novel in which a battle re-enactor and a military sci-fi writer team up to stage war games played with real bullets and rockets and real blood. It won’t be too far-fetched.